Sen. John McCain (R-AZ), who was diagnosed with brain cancer in July of 2017, has died. It’s the same form that took the life of the late Sen. Ted Kennedy in 2009. Cortney wrote on Friday that Mr. McCain would be suspending medical treatment. For the past year, the Arizona Republican has been fighting the disease, which has kept him from Washington D.C. Sen. McCain cast the deciding vote in the GOP’s failed attempt at the so-called skinny repeal of Obamacare. The measure went down 49-51. He has remained in Arizona for medical treatment since the end of 2017. Senator McCain was 81 years old, passing away nine years to the day of his colleague Sen. Kennedy, according to Jonathan Martin of The New York Times. Mr. McCain ran for president in 2000 and 2008, becoming the Republican Party's nominee in the latter contest, though was ultimately not successful. He served with the U.S. Navy during the Vietnam War, being shot down over North Vietnam in 1967, where he remained in captivity for nearly six years. He was released in 1973. McCain succeeded Sen. Barry Goldwater, "Mr. Conservative," in 1987 after the latter decided to retire. Karen and I are praying for Senator John McCain, Cindy and their family this weekend. May God bless them all during this difficult time. UPDATE: President Trump sends his condolences, along with scores of other public officials, including U.S. Senators and former presidents. George W. Bush and Barack Obama have released statements on the passing of Sen. McCain. Sen. Chuck Schumer (D-NY) plans to put forward a motion to renamed the Russell Senate Office building after McCain. R.I.P. Captain John Sidney McCain III, USN, Ret. ???? Fair Winds & Following Seas, sir! Honor @SenJohnMcCain and his remarkable career of service, whether you agreed with him always or never, just honor him. No arguments. No using the moment to score points or settle scores. Just honor a great American. Condolences and prayers to the McCain Family. Gratitude and respect for John McCain, who served the nation honorably and courageously as a Navy Captain, POW in Vietnam, and US Senator. Rest In Peace Senator John McCain. I will never forget the moment in 2008 when he took the mic away from an audience member who was asking about then-Senator Obama using troubling personal language. 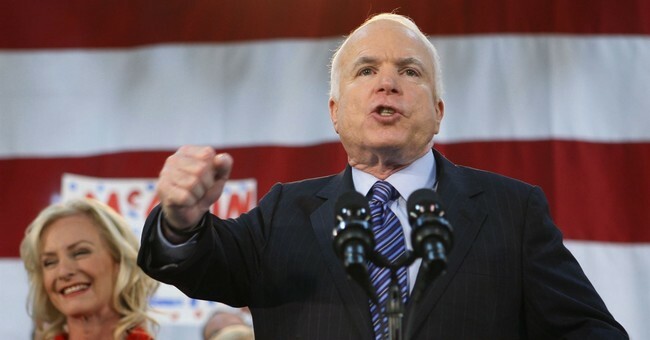 Senator McCain explained political disagreement didn’t mean personal denigration. Rest In Peace John McCain. He was a good and courageous man with strong values. He represented so much that is great about America. Arizona Republican Sen. Jeff Flake intends to join the effort to rename the Russell Senate Office Building for his late colleague, John McCain. Shortly after McCain died on Saturday night, Senate Minority Leader Charles E. Schumer said he intended to offer such a resolution, putting the Arizona Republican’s name on the building currently named for the late Sen. Richard B. Russell, D-Ga. There has been an increasing debate lately about renaming the building due to Russell’s pro-segregationist views.